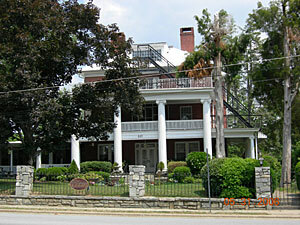 The Cedars is a large, three-and-a-half story brick veneer hotel, built in a Neo-Classical Revival style. It is nestled among large ancient cedars on a hilltop urban lot. These deontological patriarchs lend their name to the structure. There is a rough stone retaining wall across the front of the yard. The same stone is used in the hotel's foundation. Its most striking feature is a monumental tetrastyle Ionic portico. Atop the full height portico is a deck and rail. Extending like wings from the portico is a single-tiered wraparound porch with a simple railing. The structure has a hipped roof with shed dormers. Brick corbelling adorns the exterior walls between the second and third floors. Two prominent interior chimneys emerge from the roof to the main block. Aside from the impressive portico, the hotel is relatively plain. The front doorway with its transom and sidelights exhibits the influence of the Greek Revival in the later Classical Revival building styles. The original 12/1 and 6/1 sash windows have molded surrounds. The latter appear on the upper side elevations. There are diamond panes in the upper window sashes in the kitchen and between the parlor and dining room. These too are original. Several small additions have been built to the west and north sides of the structure. The roof is of asbestos shingles. The Cedars' exterior is unchanged with the exception of a replacement metal railing which tops the portico, and a front fire escape which begins at the front dormer, leading down to the deck atop the portico, and extends to the side, plus a rear fire escape. The portico roof railing echoes the simple stick railing on the wraparound porch. The Cedars is entered directly through a large parlor. To the left, separated by pocket doors, is a smaller parlor. Directly beyond the larger parlor is a columned doorway leading to a central stairhall. The original, simply detailed, single-run stairway ascends from front to rear in the hall. To the left of this hall behind the stairs is another sitting room, beyond which, in a one-story wing, is the dining room. The kitchen facilities are to the rear of the building on the ground floor. The mantels on the first floor are original and Neo-Classical Revival in design. There are nine guest rooms on both the second and third floors, which have identical floor plans. The doors, crowned by operable transoms, open onto a central hallway. Some of the rooms have private baths; other share a common bath. The plaster walls on the second floor have been covered with vertical wooden paneling. On the third floor, the plaster walls are intact. There are fewer rooms on the fourth floor. Postcard below courtesy of Tommy Shipman.